On Thursday the 26th of November the Unsung Hero Awards visited Alder Hey Children’s hospital in Liverpool to promote the awards in person. Upon arriving at the trust, we were greeted by a group of happy, smiling faces all dressed in pink t-shirts; this group represented just a small percentage of the many volunteers that constantly give their time and energy to the hospital. The volunteers were happy to direct us to the main reception desk and from there we set up our station to promote the awards. 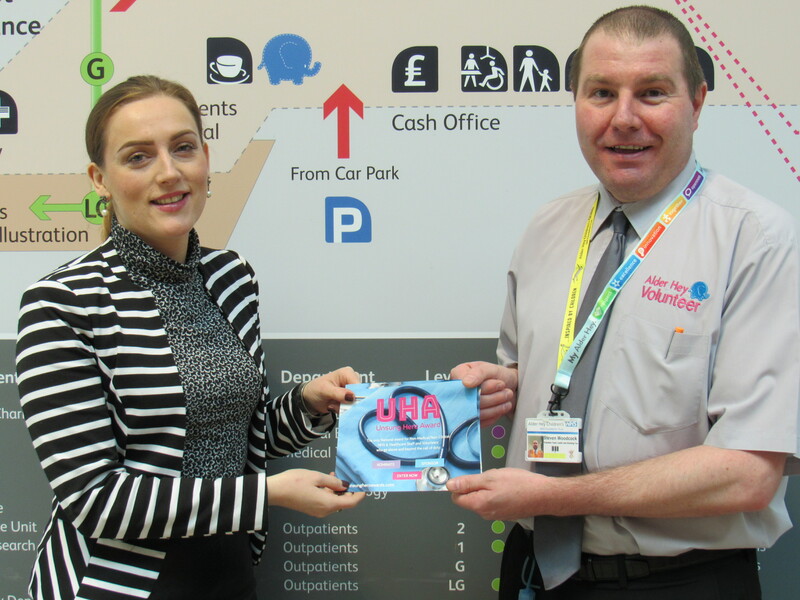 The fantastic thing about being able to promote the Unsung Hero Awards from the main foyer area of the hospital was the access that we had to non-medical staff, as well as medical staff and patients too. This allowed us the opportunity to meet a wide variety of people and to promote the awards on many levels. Even though we were only present in the foyer area for a few hours, in that time we really felt as though we made friends with the many volunteers who were busily buzzing around the area. In the case of one lovely lady: she was also handing out our flyers to as many people as possible! The feedback that we received on the Unsung Hero Awards was fantastic! So many of the staff (and patients) that we spoke to loved the idea of the award. In fact, Alder Hey deserves to be acknowledged as one of the most nominated trusts on our list. A large part of these many nominations is down to the Chief Executive, Louise Shepherd, who wants to actively promote the Unsung Hero Awards; as she fervently believes in increasing staff engagement in her hospital. Other moments of worth were when we met the head of communications - Joe Fitzpatrick, who came down especially to see us from his office and talked to us at length about how involved Alder Hey (and in particular the communications team) are in helping to promote the awards. During our stay at the hospital we also met Steven Woodcock, volunteer team leader and Chris Browne; who works as part of the concierge team. Both men made our stay that little bit sweeter thanks to their warm and humorous personalities. On a personal note, getting to interact with some of the patients humbled our team and further provided us with the conviction that what the Unsung Hero Awards are doing is vital. This award allows all members of staff, from porters to chief executives, to be acknowledged for the life-changing and inspiring work that they do daily. To see the Unsung Hero in everyone! If you know an amazing NHS Unsung Hero, you still have time to nominate them at Unsung Hero Awards website. The new deadline is 10th November, so don't wait for the last day but submit your nominations today!